Some of the 3rd grade science fair project experiments may become a little more complex then at 1st and 2nd grades. Projects may take a little longer, require observation and some work on the results. They are still exchangeable and it's pretty easy to adopt 1st and 2nd grade experiments to the third grade and vice versa. The best time for this experiment is late summer - early autumn, when there are many kinds of mushrooms are ready to be collected in the nearest forest. collect mushroom prints from different kinds of mushrooms. Cut the cap off the mushroom, close to the mushroom gills. Put the cap on the clean piece of paper (gills down to the paper). If you know the name of the mushroom, write it on the paper somewhere in the corner. Mushroom gills produce tiny spores that can be carried away with subtle wind. To make a better print, cover each cap with the glass. Let it stay for 24 hours. Carefully remove the glass and the cap. You will see "negative" print of the gills on the paper. Color of the print will depend on the species of mushroom. Pores will attach to the paper quite well but to fix them for a long term storage you can spray them with a hair spray from the distance 40-50 cm (~1.5 feet). Wait a few minutes until the spray completely dries and your mushroom print is ready for presentation. You can study collected spores under a microscope. You can also try to collect a lot of spores, put them in special substrate and try to grow your own mushrooms, but you should know that only few species of mushrooms were successfully grown artificially. For some reason mushrooms are very picky to their environment and prefer to grow in the wild. In food industry they use this method of spore extraction to isolate and check certain strains of commercially available mushrooms. This science project has its roots way back in history. This effect was first noticed by ancient Greeks, who observed it but could not explain it. Many centuries later this effect was investigated by great Muslim mathematician and astronomer Ibn Al Hatam. He acclaimed as the first man who did science using experiments to prove the theory (hence he was the first man who used modern scientific method). Build pinhole camera, observe how it works. Small (5-15 cm) cardboard box or box made of black plastic. Piece of baking paper or frosted glass. Cut a small circular hole in the center of one of the cardboard box's walls. This will be pinhole wall. Cut bigger square hole in the opposite wall. Glue piece of baking paper or tape frosted glass in place of this wall. This wall will be your image plane wall. Glue the piece of foil to the pinhole side of the box in covering the circular hole. Carefully make a pinhole in the foil using the needle. Make sure the hole is small and round. (You can make the hole first and then glue the foil to the box). Check your pinhole camera (or camera obscura) in the dark room. If you put some brightly lit object in front of the camera (that's where you need a torch) you should see it's dim image on the baking paper/frost glass. Is it sharper if the bright object further closer to the box? What's strange about this image? What happens if you make 2 pinholes in the aluminum foil close to each other? What happens if you make pinhole of bigger size? What happens if instead of the aluminum foil you put a lens on the front side of the box? Because the pinhole is so small and lets only a tiny amount of light in the camera, the image on the image plane wall will be very dim. You will see it only in the dark room and only if camera is pointing at well illuminated objects. If you have a room with dark curtains you can darken it during the day and point the camera outside. It may or may not work. Other things to watch white flower illuminated by bright light from a short distance. Lightbulb. Candle flame will work too (make sure you do this part under adult supervision!). Another great object for pinhole camera is our Sun. Brine shrimps are available in the pet shops as a fish food. Brine shrimps live in salty inland waters (but not in the sea). They can be used as a model animals in science fair experiments regarding water quality and contamination. Study brineshrimp development and anatomy. Zoom lens or a microscope. Fill the jars with tap water and let it stay for a few days to clear off chlorine. Dissolve 1.5 tablespoon of rock salt in quart of water (brine shrimps can live in the range of different salinities so you should not be very accurate). Put brine shrimp eggs in the water and leave them for 24 hours at temperature ~20-25 C.
In 24-48 hours you'll see that some of eggs have white embryos attached to them. Few hours later you'll see a first baby brine shrimp (called nauplii) free floating in water. Feed them with a small amount of yeasts and/or boiled egg yolk or flour. Watch them in zoom lens or under a microscope, draw stages of development. This 3rd grade science fair project is just an excuse for you to play with frogs/toads. Well, seriously our goal is to study frog lifecycle, specifically frog development and metamorphosis. There is an easy way to do this project - go google for frog life stages, copy and paste into your presentation, draw some pictures and you're done. The right way is to actually build a little froglet farm and grow froglets starting from the eggs. Tadpoles are the best pets - they do not demand a lot of attention. You only need to feed them from time to time. Every week or so you can make a photo or draw them and keep track on their progress. Perfect time for this project is from March to May (depending on the climate and latitude of your place). First you need to build simple aquarium and get the frog's eggs. You don't need to buy an aquarium. Pretty much any container that can hold more then 2 liters (~.5 gallons) of water will work. It can be made of glass or plastic. Garden pond (if you have one) will work even better and you can grow more frogs but of cause it's harder to make observations in the pond. It's OK to use tap water, but you should not put eggs or tadpoles in the fresh tap water. It should stay in the warm place in the open jar for at least a day or two to get rid of chlorine. Chlorine added to kill germs and can be harmful for the eggs and tadpoles. In fact the best water to use is the water from the same pond you're going to collect eggs from. Rainwater should work fairly well too. It's not a problem to collect frog's spawn from a small ponds in your area during spring months. You'll need rubber boots, few plastic containers or zip bags, and ideally one big container for water and pond plants. Try to collect eggs from a couple of different sources. There are chances that you will collect eggs of couple of different species (they'll have different color and size). Do not take many eggs, 5-10 from each source is enough. The more eggs you have the more water you'll need to keep tadpoles in good conditions. Do not forget to write down where exactly you collected the samples (that's the right way to do the science project!). Put each spawn sample in the individual container. You should mark the container so that in future you'll be able to tell which tadpoles are from which place (and you should probably release baby-frogs at that place). Put container in the safe place. Do not put it in direct sunlight. It should always be partly shadowed. It's good though if it'll be able to catch a little bit of sunlight for some time during the day. optimal temperature for growing tadpoles is 19-23 C (66 - 73 F). Temperature will affect tadpole growth rate and how fast tadpoles will begin their metamorphosis. make sure you provide fresh water. Do not replace the whole amount at the same time. At the very early stages of life (2-3 days) tadpoles do not need food. They'll leave the egg and attach themselves to some water plants if you provide them or even to the container walls. They will feed on the remaining yolk from the egg. At the end of this period they'll develop proper tail, gills, eyes and other organs and will start active life. They will eat microscopic algae from the surface of the container as well as water plants. It's recommended to give them lettuce or boiled spinach. We tried to feed them with very small amount of bread. As tadpoles grow they need more food to build their bodies and prepare themselves for the metamorphosis. When you notice that tadpoles got hind legs (first they look as small buds at the base of the tail) it's time to introduce some meat in their diet. If you won't give them some meat they'll find it. They will attack kill and eat the smallest tadpole in their group (cruel world!). So give them some meat to prevent bad behavior! You should give them very small amounts of meat, so that there is no leftovers! 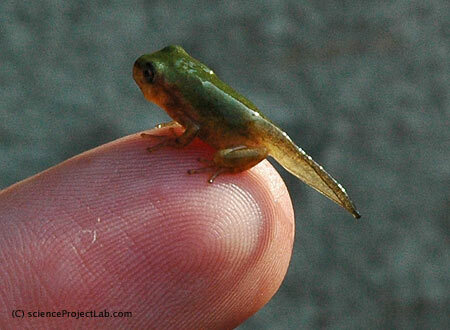 There is a moment in the life of every tadpole when it loses its tail and gills and becomes a frog. This is one of the most dangerous moments in it's life. A lot of tadpoles die at this stage. There are many reasons. Tadpoles need to find safe place near the pond where they can climb from the water and sit still for many hours while metamorphosis happens. During this hours if you check them you'll see how their tail becomes smaller (actually it takes 2-3 days for tail to disappear completely and how long it takes depend on the species and some other factors). Also they have to completely change of their breathing system and do some work on blood circulation system. And this is a BIG deal! So they are almost motionless and very vulnerable during this period. If they would not find where to climb from the water they will drawn. So it's your duty to provide them some safe place to sit through their transformation. Small piece of wood floating in the container should do. It should be half submerged in the water so that froglets could find the way to the dry part of it. If you grow froglets in the garden pond they should not have a problem climbing out of water. Look for them on the leafs or in the grass near the pond. Draw and write down everything what happens to the tadpoles. When they hatch (write down date/time)? Do they hatch all together? How long they spent attached to the leaves before they start active swimming? What is the temperature of the water? When you first noticed hind legs(write down date)? Front legs? Do they active all the time or they spend some time resting (maybe they sleep?!). Do you think that all of your samples are the same frog species? find out how many different species of mold live in our home. Few small plastic containers or one big container with lids. One or two different fruits. Put a slice of bread and fruits in the individual containers or one big container. Spray them with water and leave the containers open for a couple of hours. Put some tea leaves in the jar and fill with hot water. Let the tea cool down and leave it open for hour or two after that. Cover the jar and containers with the lids and put them in a dark warm place. In a few days depending on the temperature and number of other conditions you'll notice mold growing. Depending on the species it may form circular colonies or fluffy mass that may fill a lot of space. Day or two after you 'll notice the first mold started produce spores. 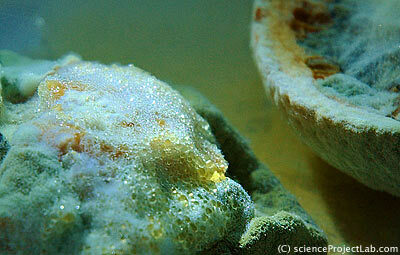 They will be visible usually at the center of the colony and may be of different colors depending on the species. Do not open container lid if you can see through. If you opened it do not touch the mold! Try not to breathe in the spores they may cause allergy and even infection! Hold your breath if you opened lid and looking at mold closely. Try count individual colonies and draw them. Colonies floating in the water surface of the tea jar may look very beautiful Try to take photos of them. Try to identify mold species. Dispose containers after you're done with this experiment! Check this Bread mold experiement.